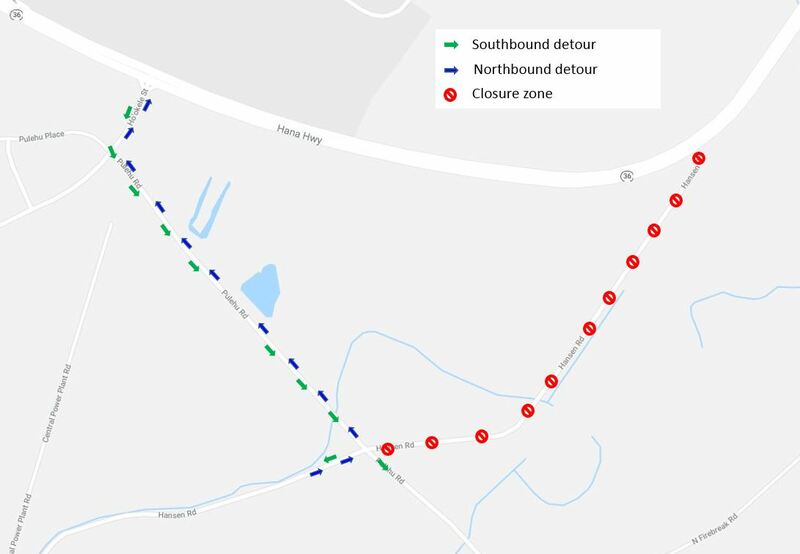 KAHULUI – The Hawaii Department of Transportation (HDOT) advises Maui motorists that Hansen Road will be closed in both directions between Hana Highway (Route 36) and Pulehu Road on Saturday, April 6, 2019, from 7:30 a.m. to 7:30 p.m., for pole replacement work. Northbound motorists may bypass the closure area via Pulehu Road and Hookele Street to access Hana Highway (Route 36). Southbound motorists may use Hookele Street and Pulehu Road to access Hansen Road. For a detour map, click here. Electronic message boards are posted throughout the area to notify motorists of the closure. Special Duty Police Officers will be on-site to assist with traffic control. Emergency vehicles, first responders, and Maui Bus have been notified of the roadwork and will be allowed through the work zone.